CDC, Ebola & Tweet Chats: was this venue a success? In our previous post we discussed how Ebola had been emerging as a topic of discussion on social media, and how the conversation was actually dwindling as the number of lives being claimed by the virus grew. That trend has certainly changed given a series of events resulting in cases popping up in a number of other countries. The graph below provides an update that clearly shows the now surging conversation on several Ebola related hashtags. What’s more, aside from hashtag usage, the keyword “Ebola” has gone from being used in about 100,000 tweets per day to pretty consistently over 1,000,000. And on the day after it was announced that there was a case in Dallas, Texas, there were over 2,000,000 tweets containing the word “Ebola”. We also showed how authoritative entities such as The World Health Organization (@WHO) and the Centers for Disease Control and Prevention (CDC, @CDCgov) have played an important role. Not only are they needing to use social media to disseminate accurate information related to the disease, but they are also needing to police the social web looking out for rumors, hoaxes, and other forms of wrong, potentially harmful information. Liz Neporent (@Lizzyfit) of ABC News recently authored an article describing the rumor in Nigeria about drinking salt water to prevent Ebola. A practice that directly resulted in two deaths. And just yesterday I came across this tweet (below) while researching this post. Shame on them. It’s akin to modern-day snake oil. Yet it was retweeted 270 times in just one day and favorited (so help me) 113 times! So YES, the social web needs authorities such as @WHO, @CDCgov, and others to drown out such unfortunate byproducts of this era of self-publishing on the web. At Symplur, we of course have been pleased to see the CDC conduct tweet chats on a variety of topics these last few years. Recently, they’ve taken the time and effort to dedicate two of these chats to the topic of Ebola. The second of these tweet chats took place on this past Wednesday, and was again met with vigourous participation. To put it in perspective, a “busy” healthcare tweet chat will normally see as many as 800 to 1,000 tweets over the course of an hour. Wednesday’s CDC chat had 3,664 tweets during the actual hour, and that expanded to 4,580 tweets after adding the customary extra 15 minutes for residual conversation. 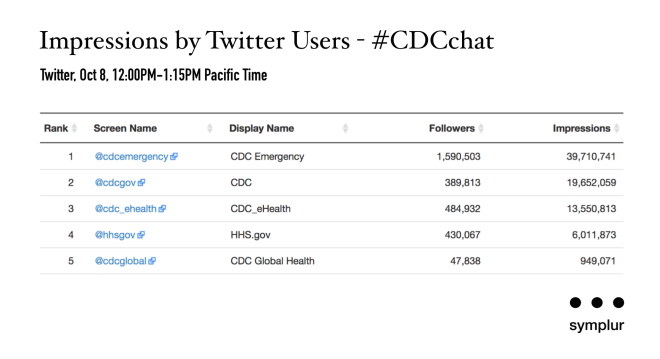 You can find the full transcript and public stats for this chat on the #CDCchat hashtag page here on our site. However, the following is a little deeper look via the help of our analytics tools and experience. 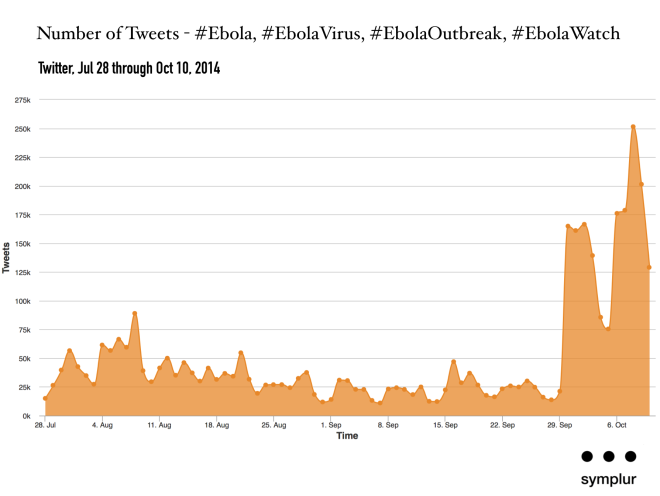 CDC on Ebola – how effective was their tweet chat? 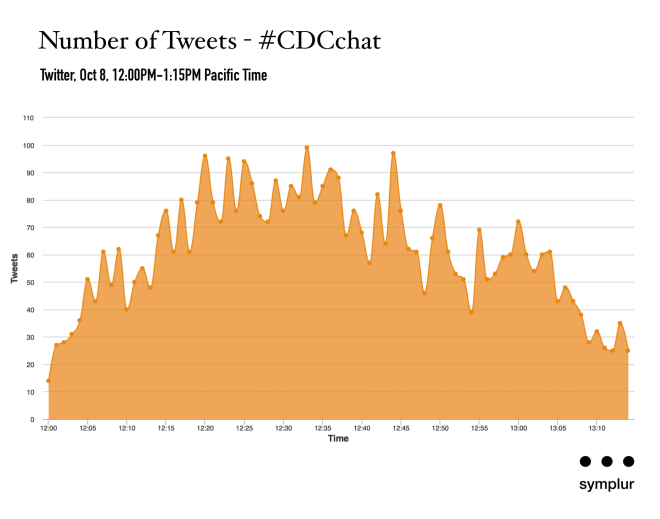 During last Wednesday’s CDC tweet chat, using the #CDCchat hashtag, the activity quickly ramped up and peaked with 99 tweets per minute at about the half-way mark. There were 1,670 participants. And the ratio of participant to tweet suggests to us that this was very much a “question and answer” type of chat, rather than a more conversational style engagement that would result in back-and-forth discussion. This shows that the CDC controlled the conversation by keeping it on point and avoiding debate. And, to their credit, that’s how they publicized it in advance, “… CDC experts answer your questions on #Ebola”. The CDC did a good job of publicizing the chat in advance as well. In the day-and-a-half leading up to it, there were a total of twenty-five tweets promoting it that were sent out by nine CDC related Twitter accounts, and by CDC Director, Dr. Tom Frieden (@DrFriedenCDC), and CDC Deputy Director for Infectious Diseases, Dr. Rima Khabbaz (@DrKhabbazCDC). Their massive network of Twitter followers took it from there with over 900 re-tweets. 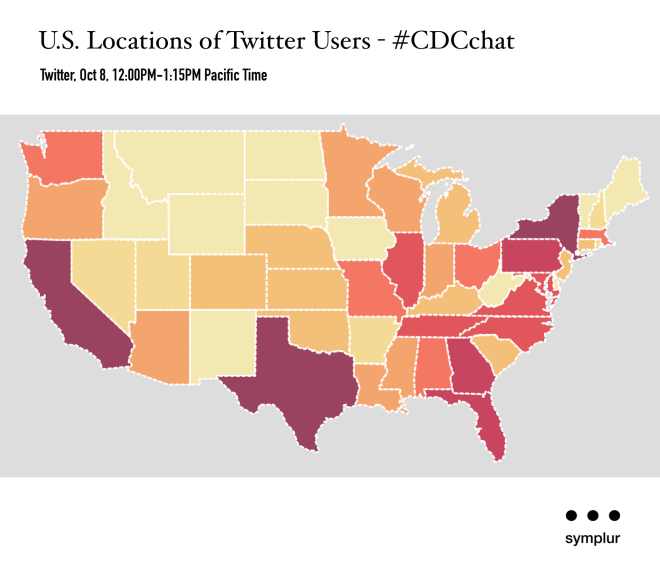 CDC Ebola tweet chat – who was reached? 73.4% of the tweets were actually re-tweets, most of which were re-sharing CDC responses to direct questions being asked. This should be seen as a positive for the CDC as well, as it quickly became a forum for amplifying their messages. As a matter of fact, when it came to making impressions, the top five Twitter accounts were all U.S. Government related, and collectively delivered 79,874,557 Twitter impressions … in just 75 minutes! The geo-location feature is turned on for only about 1.6% of tweets. However, we’ve been able to reasonably identify the location of 55% of the participants. While we recognize that the social media reach of the CDC extends far beyond the boundaries of the U.S., for the sake of this review we’ll focus on the ability of this tweet chat to engage the U.S. population. And in doing so it should be no surprise that the state of Texas, where there was recently the first case of Ebola diagnosed on U.S. soil, was the state with the highest number of participants (74), followed by New York (51) and California (44). The largest non-U.S. contingent was from Spain. In the map below, darker colors represent more participants in the chat. 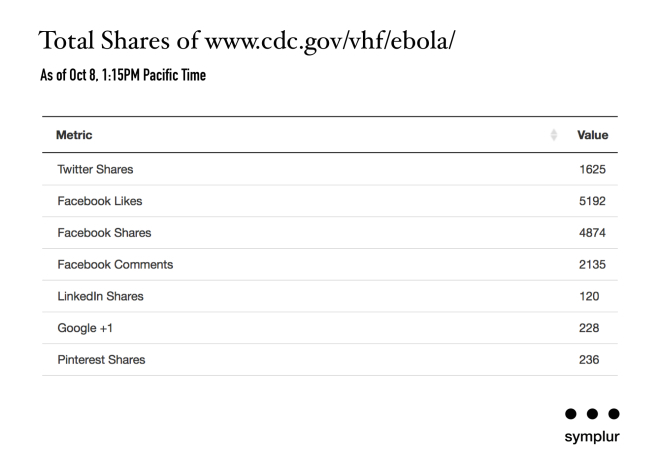 What was shared during the CDC tweet chat on Ebola? Another measuring stick for the CDC during their tweet chat would be to look at whether the event saw quality resources being shared among the participants. In this week’s CDC tweet chat 18.7% of the overall tweets included a link to some external information on the web. In this case that means links were shared over 850 times during the 75 minute period looked at. The CDC website contains a sizable amount of information related to Ebola. And the world wide web does too, but what is the quality? We all know that there is both good and bad information on the web. During this CDC tweet chat, the most frequently shared link was to a page on the CDC’s own website … Ebola Hemmoragic Fever, a parent page that has sub-pages delving into issues of signs and symptoms, diagnosis, prevention and more. This seems like another win for the CDC. However, taking this a step further, aside from how often that link was shared during the chat, how popular and widely shared has it been overall, away from this tweet chat and including other social media platforms as well? The answer is in the table below, but only the CDC knows if this is acceptable based on presumed internal goals by the agency. To us, it seems a bit light given the level of overall social media activity and concern we’re observing on the topic of Ebola. In short, we feel that the CDC did a very good job with this chat, and that their team should be commended for managing a difficult situation. We also think that their actions have further demonstrated the growing power that social media brings to healthcare when properly understood and utilized. There’s much more that we could delve into on this topic, but this post is just scratching the surface of what can be learned about how to best leverage online social networks as an effective means of rapidly disseminating important information. The point being, everything we do, digitally, leaves a record. And that record is a bit like “game-film” is to a coach. It’s an opportunity to study not only what went right and what went wrong, but to deliberately assess how we can continue to do better, regardless of the outcome. Social media has gone from novelty to a legitimate tool in the pursuit of a healthier society. The CDC just showed that.